We just snagged a few LBs for the Downhillers out there. Usually I'd Let this one slip by without mentioning them here... But this deck is crazy. Both Trucks are Canted forward, and the deck sits super low to the ground, it swings more like a hammock than a regular skatedeck. The deck is also really flat and then scoops up along the sides. Evo: Designed by a World Champion as the ultimate race board, the Evo is exactly that... and then some. The Evo has won more races in the past 4 years than any other board and has been the choice for 3 World Cup champions. 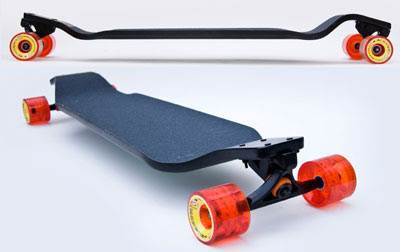 Although this board was designed with racing in mind the shape has become extremely popular for freeriding. The 2" dropped platform keeps your feet locked in and low to the ground while the angles of the nose and tail give you stability and the perfect feel through turns. Whether you're racing or shredding your local hill, the Evo will make it that much better.